!NuB!Donut has been working hard to add his ideas into Smokin' Guns. He has re-released his Nub Map pack up on Moddb for you to download. So if you haven't already, give it a download and let him know what you think. !NuB!Donut has also been trying his hand in modeling (some pun intended). He has modified Tuco and Sentenza into mighty Indians for your shooting pleasure! You can get the files from Moddb as well, and make sure you post your comments and feedback in this thread. But wait! There is more from !NuB!Donut. What would an Indian be without his trusty bow and arrow? !NuB!Donut has also been working with Tequilla to bring you an new weapon. You can get more information about the new weapon here in this thread. 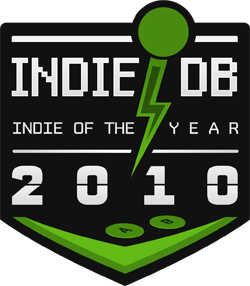 Click on the "Nominate for Indie Game of the Year"
Last, but not least, our sombrero wearing, gun shooting, coding bandit sparcdr has been working on getting Smokin Guns up and running on Desura. Desura is a community driven digital distribution service for gamers, putting the best games, mods and downloadable content from developers at gamers fingertips, ready to buy and play..... yeeehaaa thanks sparcdr! For more information, head on over to the Desura website or the Desura Moddb Page. Stay tuned, we will try to get a Desure tutorial forum up for those who want to try it. - Any game can make the top 50 except for games released in previous years which have not released a significant update in 2010. 1.1b4 was released in Jan of 2010, so I would think we would qualify.... after all the icon is on our Moddb page. Yeeehaaaa.... we are in the top 100!! Now go and vote for us again!! On Desura is 1.1b4 which I bundled and updated over a base copy. There's map changes and code backports. Just being a new distribution channel and having some content been changed should be enough to keep us in the running.